I called for help, and the spirit of Wisdom came to me. Well good morning, good morning. 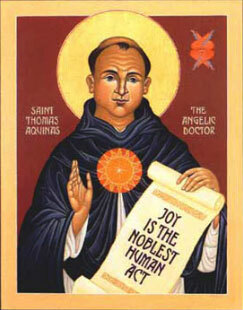 And welcome to you as we celebrate the Feast of St. Thomas Aquinas. It was a remarkable time in the history of Western culture. My brother Thomas was born in 1225 and died in 1274; he did not survive to see fifty years. But he lived during remarkable times. The Crusades had proven to be a miserable failure. The inquisition had begun recently in Toulouse, France, and Dante was writing his major works. Gothic architecture was beginning to take root. The institution of universities had only just begun to arise. Within 100 years, a remarkable period in European history we call the Renaissance would begin to flourish. And coming largely from the east, a new wisdom began to spring up. The works of Aristotle, long lost in the West, had been recently translated into Latin. Many in the western Church had been openly hostile to this “new learning” because it was clearly pagan. And perhaps because people have “itchy ears” it was widely read and became a prominent philosophy of the time. And so, the notion began to swell that there were at least two kinds of truth. There was philosophical truth (or what we might call scientific truth), and then there was biblical truth. And it all depended on your point of view, you see, which you thought made more sense. Onto this scene strides my brother, St. Thomas Aquinas. He did not initially seem like he would have much to offer the world. His fellow schoolmates called him “the dumb ox.” And yet his biographer, Gugliemo di Tocco, describes him as a man consumed by the holy mysteries of the great sacrament of the Eucharist, the sacrament in which we’ll soon share. The Italian term he used was divorato; Thomas was devoured by a sense of awe at this great mystery. But his intellect was also set aflame by the works of Aristotle. From within that huge frame, within that dumb ox, shone one of the finest minds of his time, perhaps one of the finest minds of any time. And he was absolutely and mercilessly committed to knowing the truth; he thought that was one of our highest purposes as humans. And one of his investigations, his searches for the truth, is still widely taught and used today in seminaries and schools of philosophy. We call it The Summa Theologica. And Thomas knew, through his confrontation of and dwelling within the divine mysteries, that God’s truth would surpass and could not be contained by human speech or knowledge. In John’s Gospel, Jesus promises to send us the Holy Spirit, the Spirit Jesus called the Spirit of Truth. And among his many invaluable contributions, Thomas laid waste to the notion that there were many separate inconsistent truths, that there was philosophical truth and sacred truth. You see, back then, not unlike our day, many folks saw a contradiction between faith and reason. And there arose something called the doctrine of double truth: for example, that something might be true scientifically and false scripturally, and both of them could be correct. Thomas wrote that the truth that “human reason is naturally endowed to know cannot be opposed to the truth of the Christian faith.” The truth cannot be sequestered. Because all truth comes from God, who is Truth and in whom there is no deception, if there is an apparent contradiction between reason and faith we have either reasoned poorly or misunderstood the faith. But, he proclaimed adamantly, there is only one truth. In today’s Gospel, the Logos asks us “Have you understood all this?” But this wisdom, this divine truth, is to be felt and not just known, to be studied with the heart and not only the mind. This is a Truth, a wisdom, that is not so much about a problem that we figure out or an argument we can win, as it is about a person with whom we fall in love. This entry was posted in Uncategorized and tagged Anglican, Bible, Disciple, Christianity, Church Fathers, Dominican Order, Episcopalian, Religion, Saints, Spirituality, St. Thomas Aquinas, Theology. Bookmark the permalink. Yes, I believe he did. I’ll see if I can find the reference. Be blessed, and be a blessing. I think it’s from the Summa, Second Part of the Second Part, Q28, St. Thomas Aquinas.